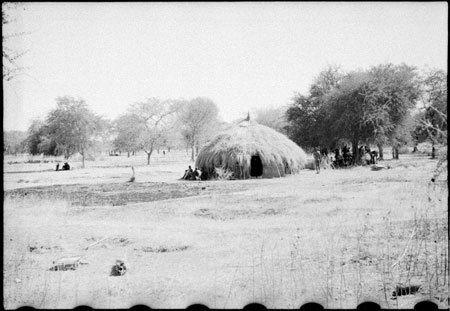 A Dinka homestead with hut and cattle dung drying in the foreground. The context of the image may be that this homestead of Southern Kordofan was encountered on his way to Kutum and Tibesti in July 1938. Morton, Chris. "Dinka homestead" Southern Sudan Project (in development). 03 Jan. 2006. Pitt Rivers Museum. <http://southernsudan.prm.ox.ac.uk/details/2004.130.32912.1/>.